Some friends of ours returned from Abu Dhabi for the summer, and wanted to take a Brannen/Concepción family trip to Atlanta. It was an opportunity we could not refuse. We stayed at the Hilton Garden Inn because of its proximity to the places we wanted to visit, and because Hilton was offering a package called “The Great Getaway” that offered free breakfast. Sign us up! Gideon and Mana enjoy some alone time. 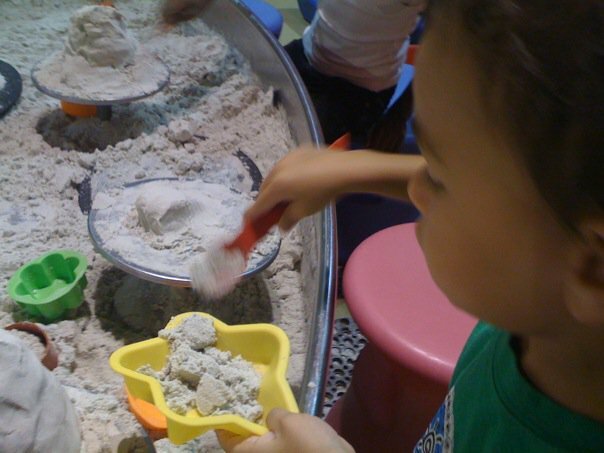 Gideon plays with the moon sand. That place seemed so much bigger (and cooler) when I was an elementary school kid on a field trip. We saw the Galaxy Gameshow at the planetarium. 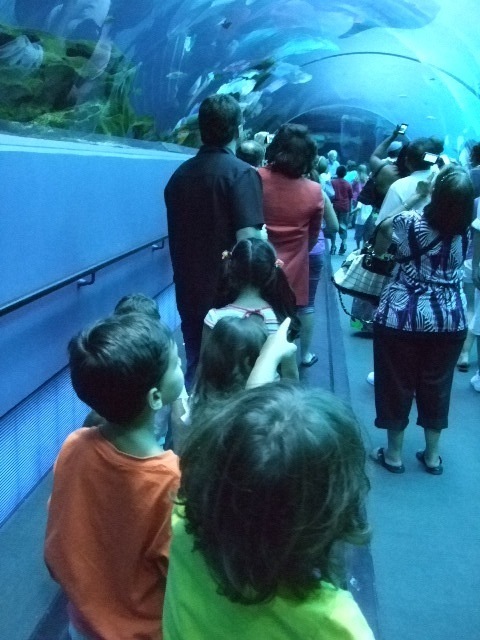 I think the kids enjoyed it, but I don’t really know. I was asleep. And so were the other three adults. 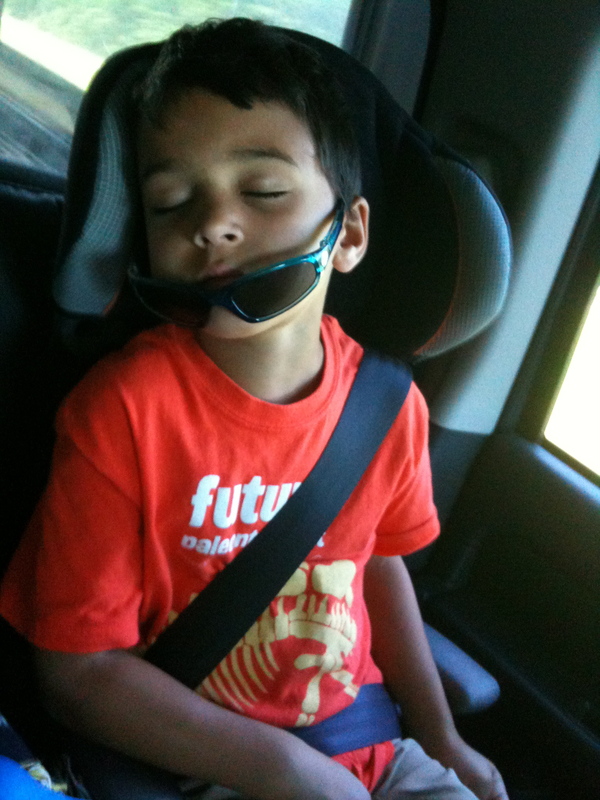 In fact, Eddie said as we left, “So we paid $12 for a nap?” Yes, yes we did. 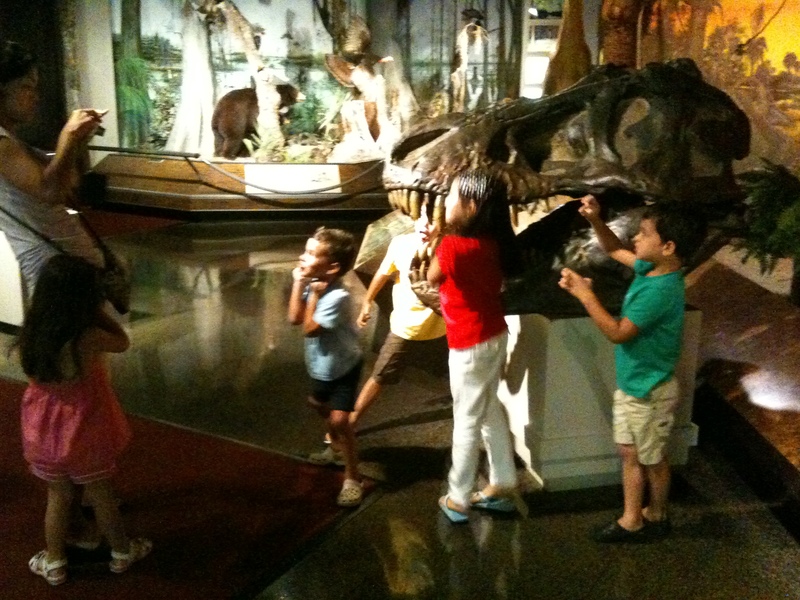 Fernbank is to the American Museum of Natural History as CitiTrends is to Henri Bendel. It’s my favorite mall in Atlanta, and I used to work in one of the clothing stores when I was in college. (I won’t say which store because it is just too embarrassing, even for me). We weren’t really there to shop, though. I had to get the hinge on my MacBook Air fixed. While I was doing that, everyone else ate ice cream. 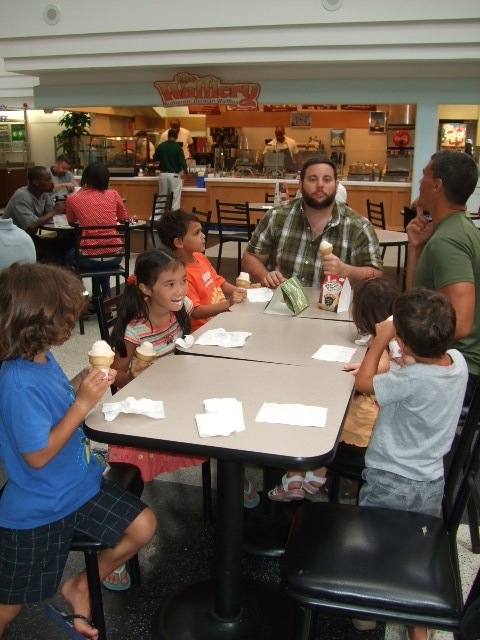 The screaming stopped when they got ice cream. This is my favorite hotel in the world, and I love this restaurant. It’s a little pricey, but it is worth it for the view. 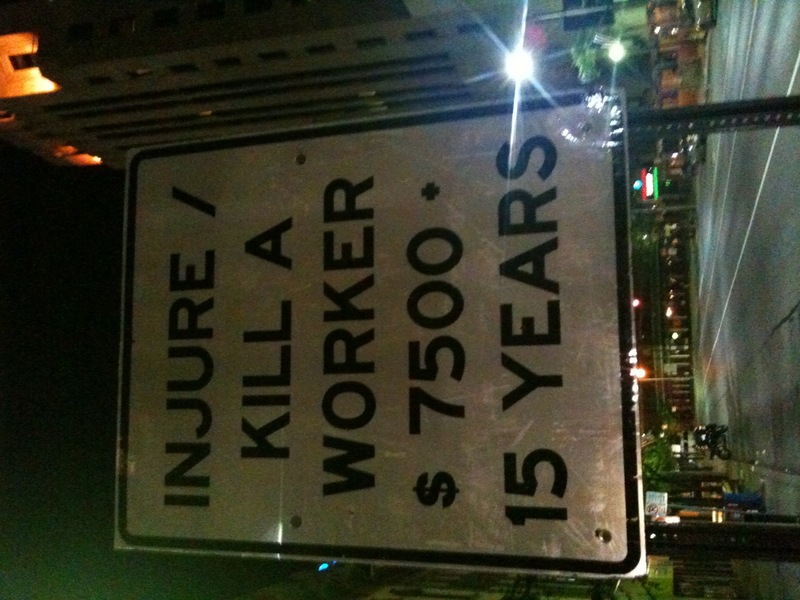 On the way there, I noticed this sign. 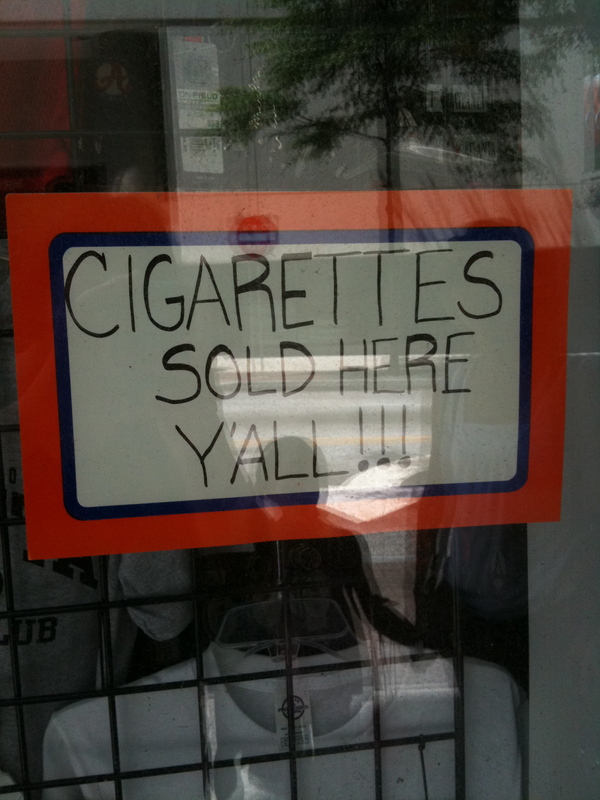 Only in the South, y'all. No visit to Atlanta is complete without a naked dog with cheese, fries and an FO (Frosted Orange). Of course, then I slip into a grease-induced coma, but I don’t care. The plan was to go to The Old Spaghetti Factory (cheesy but yummy and cheap) but it was closed. (For those of you keeping count, that’s the fourth of my favorite restaurants that has closed in the past year. Am I bad luck?) So we went across the street to Mary Mac’s. Despite it being an Atlanta landmark, I had never eaten there. 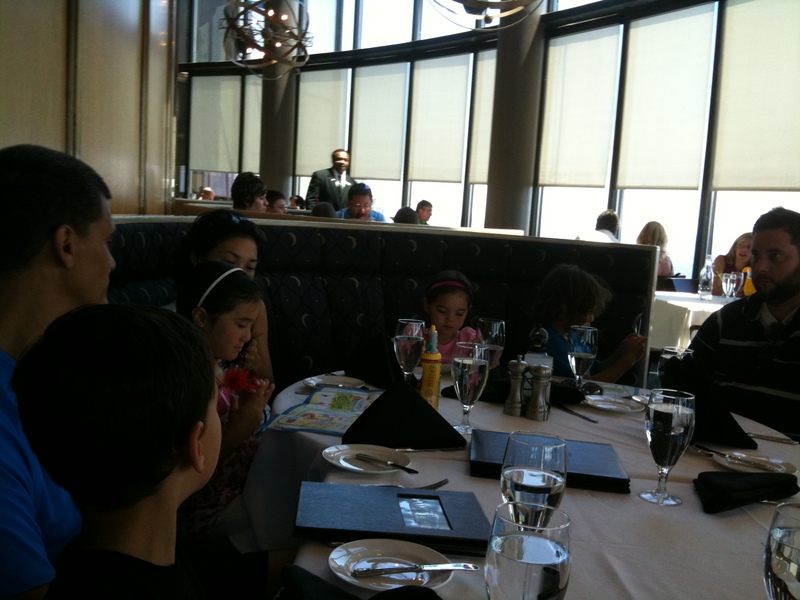 It is Mrs. Wilkes’ Dining Room and The Lady & Sons restaurant in a larger environment. A butter-induced coma ensued. I found another lovely sign here also. 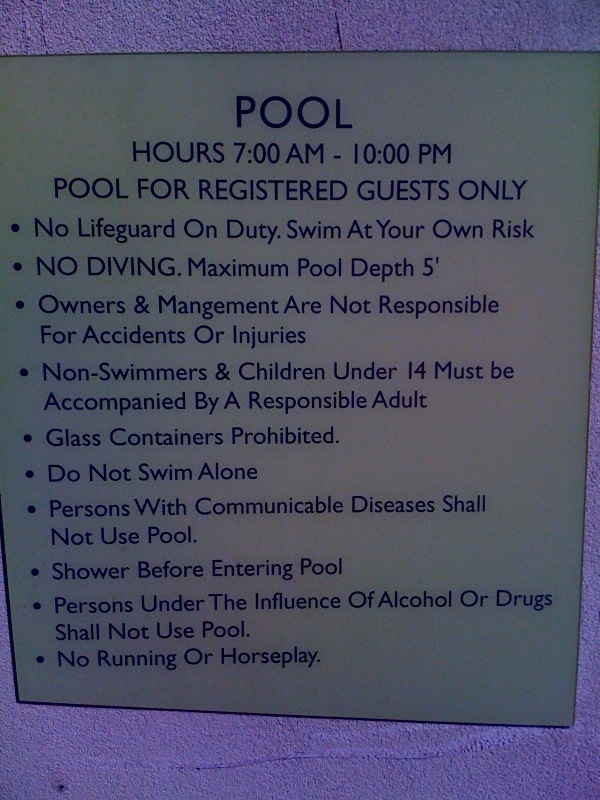 Does the "mangement" handle identifying the "persons with communicable diseases" using the pool? Overall, it was a fun trip, but also very exhausting. I think Dominic would agree. 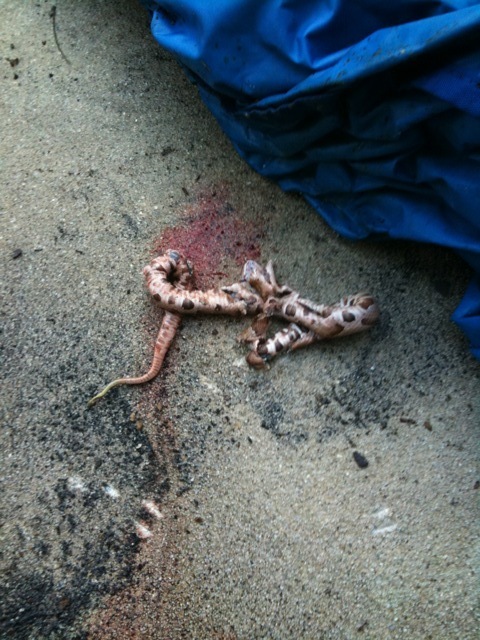 “COPPERHEAD!” my inner girly voice shrieked. The mom, independent woman and rational voices immediately gave that other one the smackdown. Eddie was taking his Saturday morning constitutional with the SCAD Bike Club, so I was left to my own devices. Ordinarily, I’d leave a snake alone. 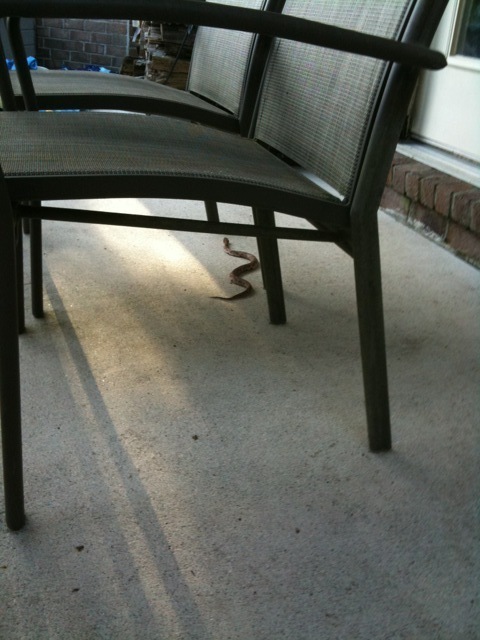 This one was on my patio, though. I have kids to protect. So, I looked in the shed for our hoe or shovel, but they were nowhere to be found. Plan C was the post hole digger. I calmly approached the interloper with my chosen weapon (which was freakin’ heavy, by the way). It saw me coming and slithered under the carcass of the blow-up water slide that has been on our patio for weeks (a sore subject for another time). I beat the snot out of that section of the slide with the post hole digger. Slowly, I lifted the corner. The snake was not there. I lifted the corner a little more and saw it. My flailing had delivered only a flesh wound. It coiled and tried to strike. I went berserk. I think it's dead now. I turned around and Dominic was looking at me through the window. His eyes were very wide. I couldn’t tell if he thought it was cool, funny or frightening. Great. He’s probably scarred for life. Faithful readers will remember me writing about my eating disorder. 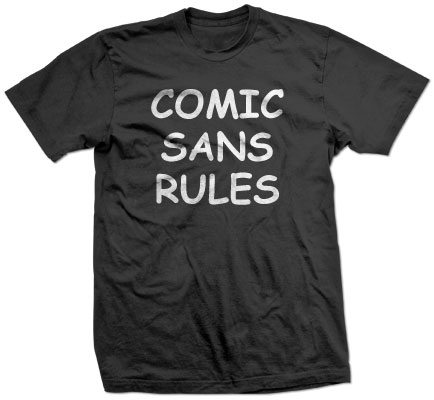 Unfaithful — er, occasional — readers may not, so here is the original post. 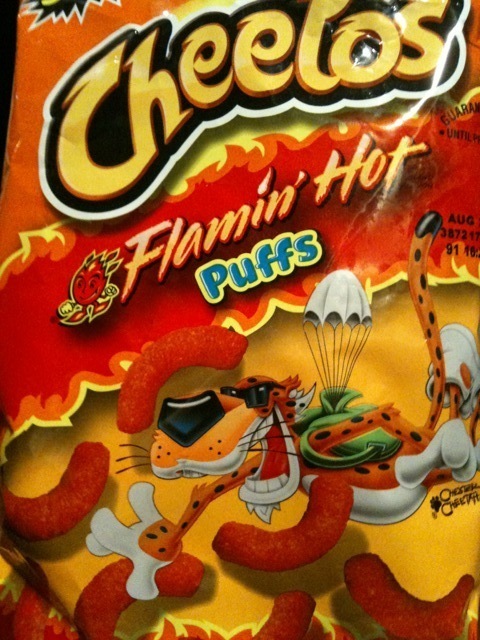 My new crush: Cheetos Flamin’ Hot Puffs. The Flamin’ Hot Crunchy version is easy to find. The Puffs, not so much. I found them in the same convenience store where I saw Billy Dee Williams. (It was a very good day.) I bought every bag they had, and now I’m down to my last one. I feel shaky. I’ve been to five convenience stores in the past two days looking for them. Naturally, I have some remarks. Well, questions really. 1. This is a selling point for the convenience store? 2. 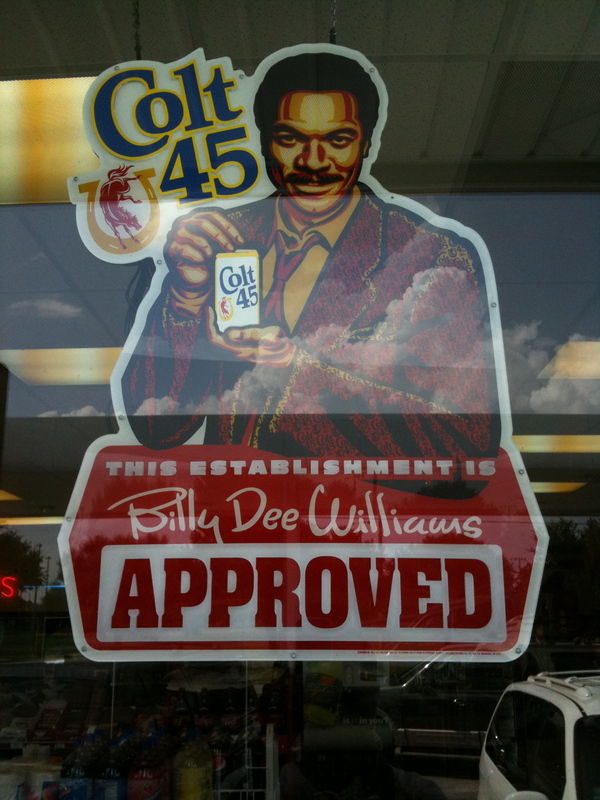 What would make anyone buy anything Billy Dee Williams is selling? He hasn’t been relevant since 1980. I took an informal survey of the four adults in the vehicle and none of us had tried this beverage. One had tried Mad Dog 20/20 (Ida, I’m still amazed!). I’m not above purchasing and consuming Colt 45 in the name of science, but I want to know what I should expect. Anyone care to give me a preview? Is it wrong that I am counting down the days until school starts again? 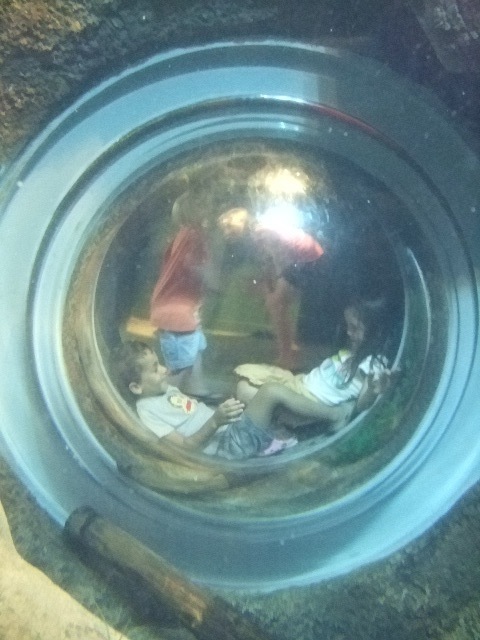 I am teaching three online classes so I can be home with the kids every day during the summer. I am not cut out to be a stay-at-home mom. I admire women who are. And those women who homeschool have my ultimate respect. Let me assure you that I love my children with all my heart. I think they are funny, interesting little people. I would take a bullet for them. I adore them. However, my amount of patience is inversely proportional to the amount of time spent alone with the boys during the summer when they have extra energy and less self-control. And the days are longer. 1. Leave the dog alone. 2. Stop standing on the furniture. 4. Keep your hands to yourself (and its corollary: Leave your brother alone). 5. If you don’t put those toys away, I’m getting a trash bag and I’ll put them away for you. Loss of patience can lead to mother rage. That concept is addressed in a hilarious manner by Anne Lamott in this post that is rather old, but still apropos. Can I get a “Holla” here? Anyone?